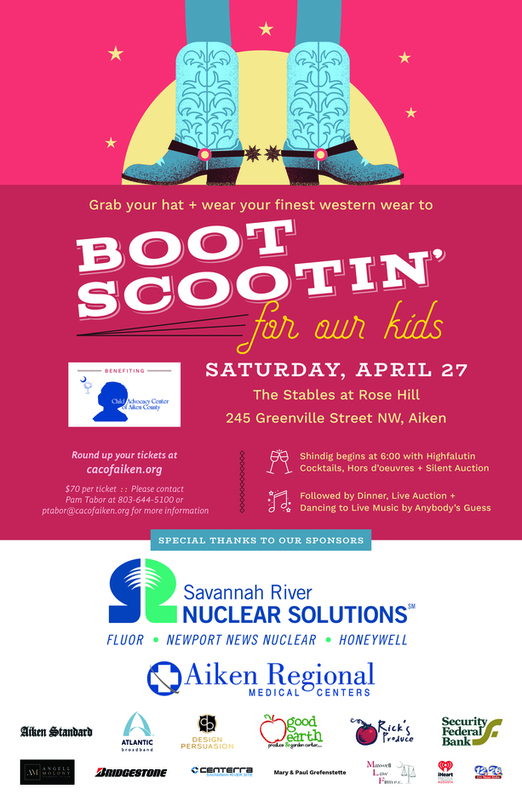 Proceeds benefit the Child Advocacy Center of Aiken County (CAC). This fundraiser is essential to our operating budget. Nearly 50% of the CAC’s funding comes from the support of private donations & business partnerships in the community. In 2018, the CACs in SC served almost 10,000 children who experienced the trauma abuse which was a 12% increase from 2017. When will dinner be served? Doors will open at 6:00pm with cocktails, hors d’oeuvres and a silent auction. At 7:15 the silent auction will close and dinner will begin. The live auction will start at approximately 7:45 and finish at 8:45pm. Dancing will begin shortly after and check out will be at 8:50pm. You can dance the night away to music by Anybody’s Guess. What kind of auction items will you have? Is the event outdoors or indoors & what if it rains? This is an outdoor event and the event will be held on Saturday, April 27, 2019 at 6:00pm RAIN OR SHINE. In the event of rain, tents with siding and additional covered spaces to keep everyone dry. It is a western themed event – so pull out your cowboy hat and boots. However any combination of denim with cocktail/formal wear such as cocktail dress with a denim jacket or dresser jeans with a formal top. Keep in mind that the dinner tables will be over a grassy area, so be mindful of your shoes. Yes, beer, wine and our signature drink ‘Honeysuckle Stinger’ (made with Honeysuckle Vodka) is included with your ticket. Water and Tea will be available with dinner. If you desire something different, the Stables Restaurant’s bar will be open at an additional cost. Special dietary restrictions can be honored if you contact us in advance. No, there will not be assigned seating. There will be reserved tables for our sponsors, and those tables will be clearly marked. What if I want to reserve a table? You may reserve a table as long as you have 8 individuals/couples who have purchased enough tickets to fill a table of 8. Please contact Pam Tabor at ptabor@cacofaiken.org or 803-644-5100 to reserve a table in your name and provide the names of the individuals who will be seated with you. We will make sure that the table is clearly marked with your name that evening. **ALL 8 tickets must be purchased in ADVANCE BEFORE calling to request a reserved table. Yes, credit card payments will be accepted along with personal & business checks.